Cargo volume out of Asia is surging and so is tension on the trans-Pacific as spot rates are jumping amid more reports that carriers are bumping — or “rolling” — cargo from scheduled slots. That’s frustrating shippers and forwarders who, until now, have helped rate hikes stick. And they do appear to be sticking. Spot rates on moves from Hong Kong to Los Angeles smashed through the $2,000-per-FEU threshold for the first time in nearly 15 months in the week ending Feb. 1, according to Drewry Shipping Consultants. Drewry’s Container Rate Benchmark showed a 20.5 percent leap in the week, to $2,012 per FEU, the highest level since late November 2008, when the trade and economic recession was just cranking up. Rates, fueled by the mid-January “emergency rate charge” by carrier members of the Transpacific Stabilization Agreement, now are running 41 percent above year-earlier levels. At the same time, shippers are increasingly frustrated at the lack of availability of vessels as large numbers of ships remain idled and carriers employ slow-steaming strategies to help manage capacity in the wake of collective 2009 losses that could reach $20 billion, according to Drewry estimates. One carrier told a shipper so many containers had piled up in Shanghai recently that they could have filled another vessel. One shipper representative, speaking on condition of anonymity, said some Chinese factories already have narrowed their New Year’s holiday time off to keep up with demand, and shipping interests believe cargo backlogs will result in little let-up in the typically slow post-Lunar New Year period. In another signal of unexpected trade strength, some carriers are returning idled ships into service at an accelerating pace. The number of out-of-work container ships last month registered its first significant decline in more than a year, as carriers put 49 vessels back to work amid stronger demand and rising freight rates. It’s part of a larger trend across all transportation modes, as railroads, trucking companies and air carriers redeploy equipment idled at the depths of the recession. The idled container shipping fleet on Feb. 1 stood at 532 ships, down from 581 at the beginning of the year, according to AXS-Alphaliner, the Paris-based shipping analyst and consultant. 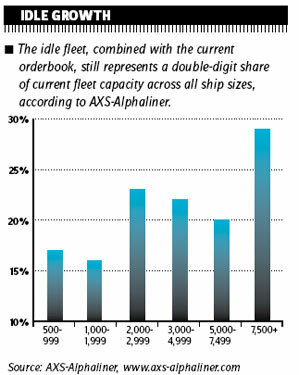 Still, the idle fleet represents 10.4 percent of the total cellular fleet, and with a large number of new ships scheduled for delivery through 2010, industry officials say the overall surplus likely will increase. Deliveries in January alone reached 30 ships totaling 133,000 TEUs of capacity, the highest monthly level of deliveries since 2008, according to Alphaliner. The outlook for the liner shipping market has improved considerably as volume and rate increases are holding firm. Carriers’ optimism is growing amid a stronger-than-expected surge in cargo demand in the pre-Chinese New Year period. Meanwhile, extra slow-steaming is absorbing excess capacity quicker than anticipated, especially for larger vessel sizes. A late-year surge in international demand and an unexpectedly strong domestic holiday shipping season rallied UPS to a nearly 200 percent increase in fourth-quarter net income. Cost-cutting and capacity reductions also helped drive the integrated company’s bottom line up to $757 million in the quarter, up from $254 million a year earlier. Expenses fell 6.5 percent in the quarter, helping to offset a 2.5 percent decline in revenue, to $12.4 billion. But UPS’s domestic air express volume grew 3.5 percent in the fourth quarter, and international package volume jumped 11.8 percent over the same period a year earlier, part of a broad expansion in demand reported across the air cargo industry. International revenue expanded 11.8 percent in the last three months of the year, giving that business a $467 million operating profit, a 27.6 percent improvement over the fourth quarter of 2008. 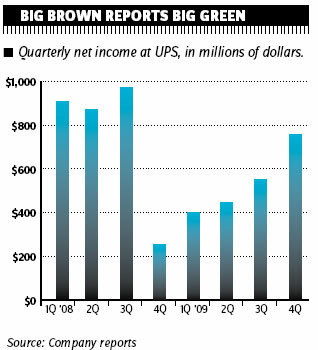 The gains late in the year were not enough to offset weakness earlier in 2009, and UPS counted a $2.15 billion profit for the full year, 28.3 percent behind 2008, on a 12 percent decline in revenue, to $45.3 billion. The company said it expects only “gradual improvement” in the economy this year but that it’s encouraged by the adjustments it made in its own operations. President Obama promised austerity in his 2011 budget, and the proposal released Feb. 1 keeps his word. That’s reflected in the budgets for the departments of Transportation and Homeland Security, whose low-single-digit increases barely keep pace with inflation. The DOT’s $78.8 billion proposal includes $4 billion for a new National Infrastructure Innovation and Finance Fund. It’s something the trade community can get behind as a way of raising and focusing investment in transportation infrastructure of national significance by tapping public and private resources. Other DOT agencies will have to stretch their resources. The Federal Highway Administration’s budget is unchanged from 2010. The Federal Aviation Administration would get a 4 percent increase, including an additional $1.14 billion for its NextGen air control system. The Maritime Administration’s budget declines by 3 percent, with no funds for the marine highways program or the Title XI loan guarantee program. DHS’s $43.6 billion will focus on aviation, border, and cyber- and nuclear security, with little emphasis on supply chain security or trade facilitation. The Transportation Security Administration’s 2011 request is up 11.6 percent, with the largest share, $734 million, going to new passenger screening equipment. Customs’ proposed budget is down 3 percent down from 2010. The $9.8 billion request provides for the hiring of 300 new officers. The good times might not be here yet for European container carriers, but they’re certainly better. First came inside news that Hapag-Lloyd broke even in the fourth quarter. Its largest investor, TUI, is due to report earnings next week (see www.joc.com for breaking developments). Then came word that France’s CMA CGM, the world’s third-largest carrier by capacity, received an $80 million cash injection from its banks as it continues to negotiate a restructuring of its $5.6 billion debt. The credit is part of a $500 million cash facility the banks agreed to provide CMA CGM as part of an agreement under which Jacques Saade would step down as CEO of the carrier he established in 1978. CMA CGM said negotiations with bankers are proceeding, and that its operations are showing “strong improvement month after month.” The carrier also is negotiating with South Korean shipyards to cancel 15 of 45 ships on order and delay the delivery of another 15 vessels. 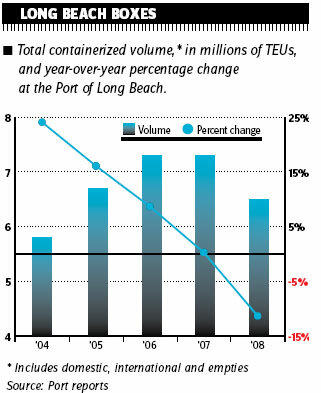 The Port of Long Beach, having met the challenge of cleaning its air, is focusing on its next big challenge: protecting its business amid stiff competition from other ports. The nation’s second-largest port unveiled a $3 billion capital construction program that includes enlarging marine terminals, building a taller, wider bridge and expanding on-dock rail capacity. “Today’s reality is that our customers are shopping around, and other seaports are vying aggressively for their business,” Executive Director Richard Steinke told the International Business Association of the Long Beach Chamber of Commerce late last month. Port expansion projects have been under a microsope at Long Beach and neighboring Los Angeles for almost a decade, delaying the start of some two dozen projects. The ports responded by developing a Clean Air Action Plan that provides a template for construction of environmentally acceptable marine terminals and rail facilities. Steinke said arduous and costly effort has allowed Long Beach to move ahead with expansion projects. Long Beach last April received the go-ahead for its Middle Harbor project that will allow the port to replace two obsolete, irregularly shaped container terminals with one more functional rectangular facility with a large on-dock railyard. Long Beach this year will release the draft environmental report for a $1.1 billion project to replace the 40-year-old Gerald Desmond Bridge with a larger, higher bridge that would accommodate more traffic and allow passage underneath of the largest vessels in operation today.